I am not the one to deny the practicality of e-books and e-readers, their handiness is extremely welcomed when standing on a long queue or sitting in a waiting room, the heavy tomes become more easily to handle, there is no panic for additional space on bookshelves and out of print titles can be found in this medium now. But my love for printed books runs deeper, in my opinion there is no comparison between an e-book and a physical one, I find it difficult to experience with an e-reader the excitement of leafing through a new book, the feeling of turning the pages back and forth, returning to a favorite scene or simply admiring a cover artwork. This sentiment is more acute when it comes to my favorite writers and their works. As much as I am in dire need of more space in my personal library I am happier when I just can pull a favorite book out of my bookshelves, in order to revisit its story, instead of just going through all the buttons and staring at a screen. To offer my latest concrete situation I’ll point out Kaaron Warren’s “The Gate Theory”. Kaaron Warren is an extremely talented writer and one of my favorite authors and “The Gate Theory” is a collection that I loved to read. However, “The Gate Theory” was released only in electronic format and despite being the proud owner of a copy I would have still liked to see this little short story collection on my bookshelves next to the other Kaaron Warren’s books I hold. To my delight, this wish will soon become true, because Cohesion Press is planning to release a print edition of “The Gate Theory”. The good news do not stop here though, this print edition comes with an improved cover, one representing the duality of light and shadow, of opened and closed doors through the lettering as well, the author’s name and the title being highlighted in black and white now. 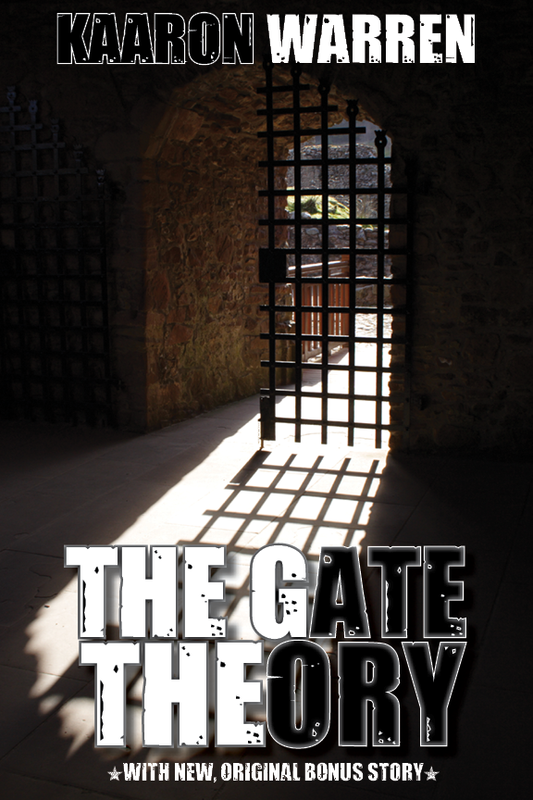 Plus, the printed edition of the book includes a new story, original to this collection, entitled “The Gate Theory” too. I, personally, cannot wait to see Kaaron Warren’s “The Gate Theory” taking its rightful place on my personal library. Thank you, Mihai! Hopefully we will share a glass together soon and I'll be able to sign the book for you!